This unique interpretive study seeks to examine aspects of the building of the modern Turkish Nation. 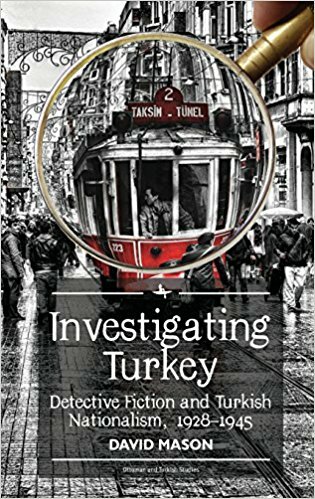 In particular the transmission of Kemalist Turkish Nationalism at the level of popular detective fiction. (Mustafa Kemal Ataturk (1881-1939) – Military/Political leader; First President of Turkey). Mason argues that nationalist concepts and ideas were disseminated through the medium of this literature. 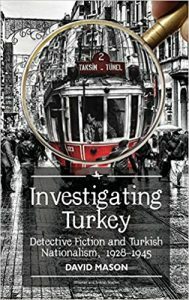 After introducing the genre of detective fiction, the works of five Turkish authors are analysed and found to promote such Kemalist concepts as: 1) Hardwork or Industrious; 2) Physically fit; 3) Feminist in perspective (All Turks are to participate in the nation); 4) Rationalist; and 5) Patriotic. The book represents an approach to cultural historical studies in which publications are viewed as ‘events.’ These ‘events’ provide access to a cross section of Turkish society including values, mores and the worldview of regular citizens, or at least, attempts to shape and direct popular beliefs about what it means to be a Turk under Ataturk’s vision of the Turkish Republic. David Mason 1971-2017 completed his PhD (2011) at the Institute of Islamic Studies, McGill University. He was a friend and colleague. John of Damascus and Islam is the 34th volume in Brill’s series on the History of Christian-Muslim relations. A summary from the back cover: How did Islam come to be considered a Christian heresy? In this book, Peter Schadler outlines the intellectual background of the Christian Near East that led John, a Christian serving in the Damascus court of the caliph Abd al-Malik (685-705), to categorize Islam as a heresy. 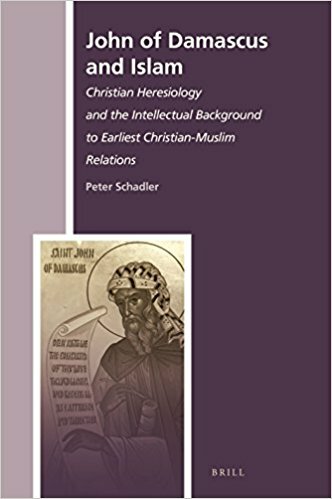 Schadler shows that different uses of the term heresy persisted among Christians, and then demonstrates that John’s assessment of the beliefs and practices of Muslims has been mistakenly dismissed on assumptions he was highly biased. By analyzing John of Damascus’ small work entitled ‘On Heresies 100’, Schadler proposes that the practices and beliefs John ascribes to Islam have analogues in the Islamic tradition, proving that John may well represent an accurate picture of Islam as he knew it in the seventh and eighth centuries in Syria and Palestine. Schadler also includes the Greek text and English translation of ‘On Heresies 100’, which was part of John of Damascus’ larger work on heresies and offers an insightful tabulation of potential Qur’anic references in ‘On Heresies 100’. Schadler’s work is an important offering on the nascent relations between Christians and Muslims. Throughout the year the Islamic Studies Library acquires numerous resources, books and journals (print and electronic formats), all of which contribute to the depth of the collection. Here we highlight just two works recently received. Edinburgh: Edinburgh University Press, 2017. 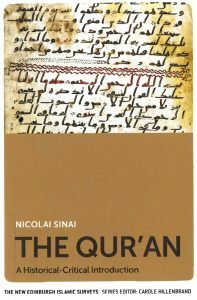 Originally published in German (Der Koran: Eine Einführung Stuttgart: Reclam, 2017), Nicolai Sinai’s 2017 English translation now grants access to a wider audience interested in a critical academic introduction to the Qur’an. At 242 pages, the work offers a concise introduction to the “basic methods and current state of historical-critical Qur’anic scholarship”. The author surveys the historical background by briefly introducing basic features of the Qur’an along with Muhammad and the milieu of the time, before moving to Part Two to discuss critical methodology. 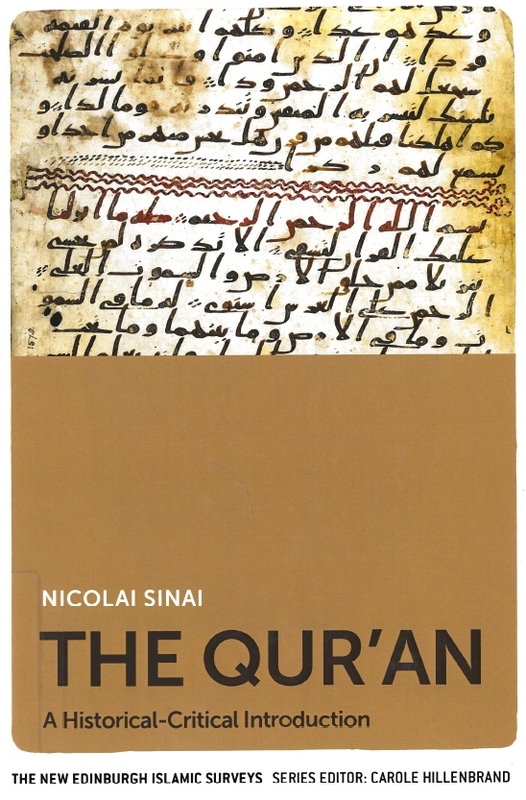 While Part Two deals with literary coherence, inner Qur’anic chronology and the broader intertextuality of Jewish and Christian contributions, Sinai completes his analysis in application to selected themes found in the Meccan and Medina Surahs. The absence of a concluding chapter to summarise his work does not negate the value of his contributions. If you are interested in academic Qur’anic studies, then Sinai’s book is a must read. The Islamic Studies Library holds a wide range of works related to Qur’anic studies in a number of languages. The collection is accessible to the public. 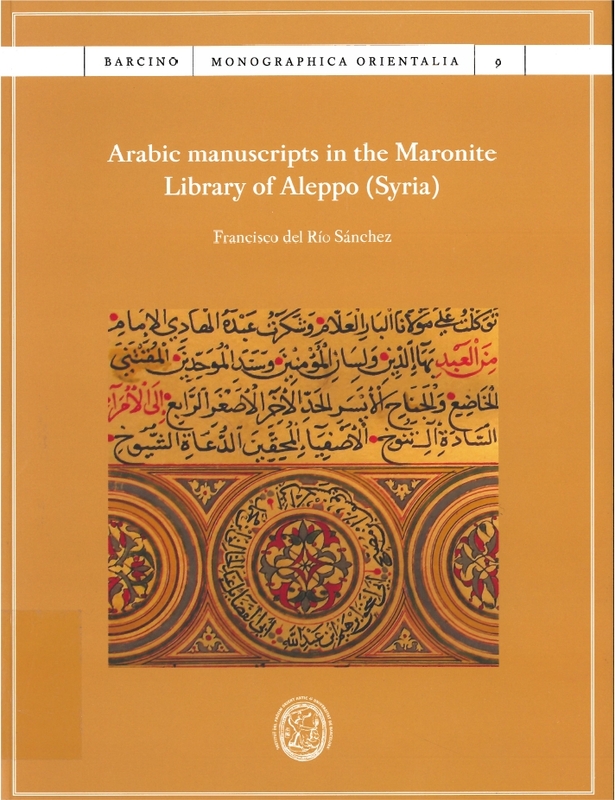 Offered as the third of three volumes, all of which detail the manuscript holdings in the Maronite Library of Aleppo, this last volume completes the catalogue inventory (more than 1640 items). 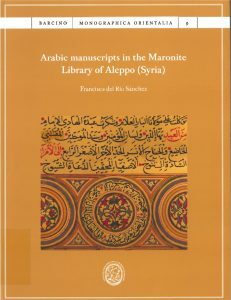 The first two volumes respectively catalogued manuscripts in Syriac and Karshuni (Arabic using the Syriac alphabet) with the final volume devoted to Arabic manuscripts. This latest volumes covers 1596 Arabic manuscripts, along with 50 images and includes an index for all three volumes (manuscripts in Arabic, Latin Script, Greek, Syriac and Karshuni). Aside from ecclesiastical works such as Biblical texts, theology, history and philosophy, the collection also contains works from Muslim authors which reflect the needs and interests of the local community between the 16th and 18th centuries and beyond. The Islamic Studies Library houses numerous catalogues of manuscripts in a variety of Islamic languages. 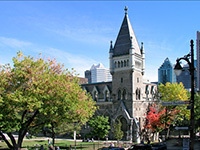 Manuscripts that are held at McGill can be found at Rare Books and Special Collections on the fourth floor of the Humanities and Social Sciences library. 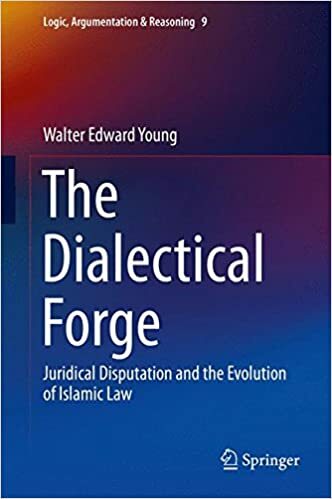 The Dialectical Forge: Juridical disputation and the evolution of Islamic law, published in 2017, is the first monograph of Dr. Walter Young (although he has a number of other works in preparation, see below), graduate of the Institute of Islamic Studies. This book is a revised version of Dr. Young’s 2012 Ph.D. thesis, supervised by Prof. Robert Wisnovsky and Prof. Wael Hallaq, and is the 9th volume in Springer’s “Logic, argumentation & reasoning” series. JM: This is a revised version of your Ph.D. thesis? What aspects have changed between the two versions? A new section detailing Abū Isḥāq al-Shīrāzī’s theory of qiyās has been appended. JM: What can you tell us about this book? WY: The real aim of the book is to bring juridical dialectic into the limelight as a key dynamic in the shaping not only of substantive rulings (fiqh, furūʿ), but of legal theory (uṣūl al-fiqh) and dialectical theory (jadal/munāẓara) itself. In fact, in my view, and I believe it is supported by mountains of evidence and obvious to most who consider it, the exigencies of dialectical disputation left their marks on all Islamicate intellectual projects whose scholars engaged in it. The study of the theory and practice of Islamicate dialectics should, in my view, provide essential concepts and tools for exploring, analyzing, and comprehending all such Islamic sciences which may in any way be qualified as “argumentative” (i.e., pretty much everything). It should therefore be a thriving discipline, but remains understudied—in fact practically unknown in the larger field of Islamic Studies (despite some excellent contributions in the last four decades). So a key aim of the Dialectical Forge (and pretty much all of my work) is to promote the study of Islamic dialectics, and to try to get scholars excited about it and involved in it. One way to do this, I think, is by showcasing the high level of sophistication attained by dialecticians (practitioners and theoreticians), by publishing and analyzing both the theory literature and example/historical disputations. In this spirit of inspiring scholars to be excited about and involved in the study of Islamicate dialectics, Dr. Young has created an impressive website: the Society for the Study of Islamicate Dialectical Disputation (SSIDD). This site hosts information and resources on the study of Islamicate dialectical theories, practices and contexts, as well as a discussion forum for scholars to share ideas and sources. JM: What drew you to this area of research? The teachings and publications of Wael Hallaq in the areas of legal and dialectical theory. And I was very privileged to have both Prof. Wisnovsky and Prof. Hallaq as advisors to my dissertation. We wish to congratulate Dr. Young on his monograph, and thank him kindly for his comments! “Mulāzama in Action in the Early Ādāb al-Baḥth;” Oriens 44.3-4 (2016) [special issue: Major Issues and Controversies of Arabic Logic], pp. 332-385. The Dialectal Forge is available through McGill Libraries, as well as through Amazon.ca and Springer. Ḥumaydān, Īmān, and Michelle Hartman (translation). The Weight of Paradise. Northampton, MA: Interlink Books, 2016. Iman Humaydan’s Weight of Paradise narrates the story of two women set against the post-war backdrop of 1990s Beirut. While making a documentary film about the reconstruction of downtown Beirut, Maya Amer stumbles upon a battered leather suitcase that will change her life forever. Inside it she finds letters, photographs, a diary, and an envelope labeled: Letters from Istanbul. The Weight of Paradise is both the story of Maya and her discovery, and also the story of the owner of these papers, Noura Abu Sawwan. A journalist, Noura fled Syria just before the Lebanese civil war to find greater freedom of expression. But as we learn from her diaries, her flight was also precipitated by her family’s denial of her sister’s suicide after she fell pregnant by a mukhabarat officer. The diaries lead us through the turmoil of Noura’s life first in Syria and then in Beirut: her family’s resistance to political repression in her childhood and adolescence, the passionate love story she lived with Kemal Firat, her Turkish soul mate and the author of the Letters from Istanbul and her commitment to writing against injustice, including publishing her sister’s tragic story. A multi-voiced, multi-genre narration, The Weight of Paradise interweaves the stories of these two women and the people who surround them within the fabric of Beirut in the civil war and its immediate aftermath. A love story as well as a story of women’s liberation and political freedom, the novel is also the tale of a city and country torn apart by repression, occupation, and war. Beirut, Damascus, and Istanbul are shown as vibrant locations where people resist state violence trying to live and thrive together across linguistic, ethnic, religious, and communitarian differences. Parsons, Laila. The Commander: Fawzi Al-Qawuqji and the Fight for Arab Independence, 1914-1948. New York : Hill and Wang, a division of Farrar, Straus and Giroux, 2016. The Commander: Fawzi al-Qawuqji and the Fight for Arab Independence, 1914-1948 (New York: Farrar Straus and Giroux/Hill & Wang, 2016) focuses on the life of Fawzi al-Qawuqji, the Arab nationalist and soldier who served as an officer in the Ottoman army during World War I; fought against the French in Syria during the rebellion of 1925-1927; fought against the British in Palestine during the Palestinian Revolt of 1936-39, and again in Iraq during the Rashid ‘Ali Coup of 1941; lived in exile in Nazi Germany during World War II; and led the Arab Salvation Army (Jaysh al-inqâdh) against the Haganah/IDF during the 1948 Arab-Israeli War. Using Qawuqji’s own archive to construct a detailed and carefully contextualized narrative of the journey that he made through certain moments, Parsons offers a glimpse of the complexity and contingency of the historical worlds he inhabited. The book has already been reviewed in Publisher’s Weekly (starred review), Kirkus, Booklist, and the New Yorker. It will also come out in the UK in January with Saqi Books. Wallis, Faith and Robert Wisnovsky. Medieval Textual Cultures: Agents of Transmission, Translation and Transformation. De Gruyter, 2016. Understanding how medieval textual cultures engaged with the heritage of antiquity (transmission and translation) depends on recognizing that reception is a creative cultural act (transformation). The essays in this volume focus on the people, societies and institutions who were doing the transmitting, translating, and transforming — the “agents”. The subject matter ranges from medicine to astronomy, literature to magic, while the cultural context encompasses Islamic and Jewish societies, as well as Byzantium and the Latin West. What unites these studies is their attention to the methodological and conceptual challenges of thinking about agency. Not every agent acted with an agenda, and agenda were sometimes driven by immediate needs or religious considerations that while compelling to the actors, are more opaque to us. What does it mean to say that a text becomes “available” for transmission or translation? And why do some texts, once transmitted, fail to thrive in their new milieu? This collection thus points toward a more sophisticated “ecology” of transmission, where not only individuals and teams of individuals, but also social spaces and local cultures, act as the agents of cultural creativity. Electronic Journal of Islamic and Middle Eastern Law (EJIMEL) is an online Open Access journal started in 2012 by the Center for Islamic and Middle Eastern Legal Studies (CIMELS) at University of Zurich (Switzerland). Published once a year, EJIMEL is referenced in the Directory of Open Access Journals (DOAJ). Articles, are preserved in PDF in the University of Zurich institution repository ZORA, are given a DOI and published under the Creative Commons Licence. As long as properly cited and used, every article can be copied, shared, or printed. Next Wednesday, 14 January, a book launch and manuscript viewing will be held in the Osler Library of the History of Medicine at 5pm. McGill-Queen’s University Press has just published The Herbal of al-Ghafiqi. A Facsimile Edition of MS 7508 in the Osler Library of the History of Medicine, McGill University, with Critical Essays, edited by F. Jamil Ragep (Director of McGill’s Institute for Islamic Studies) and Faith Wallis (McGill, History and Classical Studies/Social Studies of Medicine). The manuscript in question is exceptional: a 13th-century illustrated copy of the treatise on materia medica by a physician and scholar from al-Andalus (Muslim Iberia), Abū Jaʿfar al-Ghāfiqī (d. ca. 1165 CE).The Osler manuscript has 468 primary entries for mainly herbal, but also mineral and animal, drugs. It also includes around 2200 secondary entries that provide synonyms in a staggering assortment of languages, including Greek, Sanskrit, Syriac, Persian, Berber, Old Spanish, Latin, Coptic, and Armenian, reflecting the international character of medicine and pharmacy at the time. Complementing the facsimile edition are six essays by eminent scholars who deal with the physical features and history of the manuscript, the philological complexity of the text, Ghāfiqī’s sources, the Andalusian as well as the larger global context of the herbal, and the illustrations accompanying the text. The production and dissemination of the Ghafiqi facsimile would not have been possible without the support and generosity of McGill’s Class of Medicine of 1961. Thank you. The holiday season is upon us and the ISL will be closed as of 3pm today only to re-open its doors on the 5th of January 2015 at 9am. This has been another successful year for the ISL in terms of attendance (over 61,700 unique visitors), collection development (close to 3,000 items added including approximately 150 reference materials) and a number of additional activities (exhibitions, talks, information sessions, etc.). It’s been a busy year! Thank you for your support and enthusiasm in the ISL’s activities! On a different note, a new publication has been released entitled: “Meetings with Books: Special Collections in the 21st Century. With a Tribute to Raymond Klibansky. Illustrated Survey of Special Collections at McGill University Library and Archives.” This collaborative effort led by Drs. Jillian Tomm and Richard Virr of McGill’s RBSC provides an enlightening survey of the magnificent collections housed in RBSC. 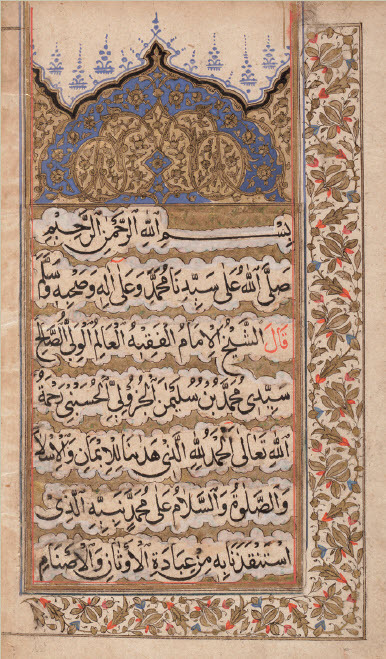 Included in those collections are many Islamic materials inclusive of Manuscripts (the image comes from the Dalāʼil al-khayrāt, RBD A6), Calligraphy, Lithographs and Rare Books. One is able to order a physical copy through contacting Dr. Tomm but there’s also an online open access version here. Happy Holidays from the ISL’s staff and we look forward to seeing you in 2015! OISO, a major reference tool for Islamic Studies as it covers the whole Muslim world from Indonesia to Morocco and everything in between. The reference tool’s usefulness just increased with the recent publication of Dr. Walter Young, a recent IIS graduate. His article entitled “Uṣūl al-fiqh” provides a concise overview of the subject as well as a splendid bibliography for further reading. To access the article you must login to your McGill account (or your local institution): Uṣūl al-fiqh. Walter’s PhD thesis The Dialectical Forge: proto-system juridical disputation in the Kitāb Ikhtilāf al-‘Irāqiyyīn (2 vols.) is freely accessible via McGill’s escholarship platform. Recently, Dr. Robert Wisnovsky of the IIS of McGill was promoted to full professor and has also been appointed to a James McGill professorship. This is of course wonderful news and a much deserved recognition for his individual achievements, but it also is an important milestone for the Institute for which we can all be proud. In related news, Dr. Wisnovsky was recently interviewed by the Montreal newspaper, Le Devoir: Humanités 2.0 – Le zéro et l’infini McGill numérise la science et la philosophie islamiques. In addition, Dr. Wisnovsky has an article in the forthcoming Cambridge University Press publication entitled Interpreting Avicenna Critical Essays.